What is a Fairly Wild Partner? Bushbabies may not be a common sighting in the Africa bush, but if you are lucky enough to see one, you will forever remember their unique calls, endearing characteristics and remarkable acrobatic leaps between trees and branches. As northern Johannesburg has grown there have remained a few small pockets of vegetation in which these little primates have managed to survive, primarily in between the cluster house blocks in Craigavon close to Fourways. These nocturnal creatures usually live in family groups between two and seven individuals and live in hollow trees or leafy nests in thorn trees. When asleep they flatten their enormous ears close to their head and then cover their head and face with their hands and long bushy tail. They primarily eat insects however the gum of the Acacia Karroo tree is a delicacy. The bushbabies who live in the suburbs of Johannesburg live a tough life with cars and suburban pets (cats in particular) as a major threat. 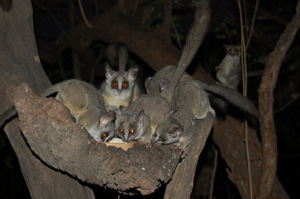 Bushbaby SOS aim to raise awareness and inform people about the bushbabies in their area. 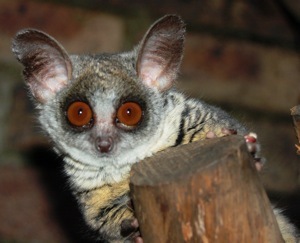 Through this they hope to protect the bushbabies primarily through the preservation of their habitat. By acting as a port of call for people who discover that they have bushbabies in their gardens they are able to advise them on how to ‘safe proof’ their gardens for the bushbabies and create a safe place for them to live away from the danger of the road. In addition by creating corridors of natural habitat the organisation is allowing the population to grow within safe and food sufficient areas. In the event that these corridors cross the road a large rope from tree to tree creates a safe bridge for the bushbabies to crawl along in safety. This organisation does fantastic working caring for and protecting one of the many species who live among us within our South African cities so quietly that most people don’t even know they are there. Those people in the area who are lucky enough to have bushbabies in their gardens know how truly magical these little creatures are. » Become a Fairly Wild partner? © 2019 Fairly Wild, All Rights Reserved.